Holiday.gr - Kastania, a trip to a myth! Kastania village during the last years, has evolved to a tourist resort. It is built in a 800 m height, in a location verdurous of fir trees. It is situated in the north slopes of Tsouka crest of mountain Itamos. 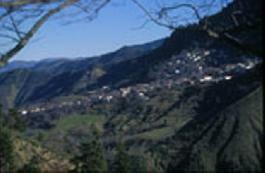 Administratively, Kastania belongs to the municipality of Itamos and is 25 km from Karditsa. This village is ideal for your summer or winter vacations, due to its privileged geographical location. It is believed that in the place of the ancient castle was the ancient town of Menelaida. In the region were found graves of the roman architecture. During your stay in Kastania it is worth visiting the church of Dormition with an impressive chancel of the 18th century. The village has a lot rooms to let, as and a civic guesthouse with 23 beds. The Forest Protection Organization has turned a lakeside piece of land into a recreation ground. There is a camping area with barbecues, taps, showers and a specially designed place for tents. Been to Kastania ? Share your experiences!